This article outlines a quick-and-dirty methodology for quantifying the user experience, which I’ve found to be very useful in providing clients with a quick, objective, visual representation of where their site stands vis-Ã -vis the competition or past development efforts. The term "user experience" refers to a concept that places the end-user at the focal point of design and development efforts, as opposed to the system, its applications or its aesthetic value alone. It’s based on the general concept of user-centered design. Take, for example, a brilliantly designed site that routinely gives server errors, or times-out. Or imagine a fantastic, database-driven application that, for some reason or other, is never used because it’s buried deep within the bowels of the site’s information architecture. In both cases, we see that the independent elements of branding, usability, functionality and content structure aren’t necessarily indicative of a site’s success. Yet, when taken together, these core elements provide the basis for the user experience. Say you’ve got a new lead — they’re unhappy with their Website in its current form and want you to help steer the site in the right direction. If you’re like me, the first thing you’ll do is take a look at the site and make some cursory mental notes. How then do you convey these ideas and notes back to the client without simply ripping the current site apart? The problem is that each of our perceptions of how ‘good’ or ‘bad’ a Website is, is skewed by our personal backgrounds and specialties within the industry. Asked to evaluate a Website’s benefits and constraints, a developer, usability professional, designer or information architect may come up with an entirely different critique. Provide your clients with a fact-based, visual representation of their site’s benefits and limitations. The methodology is quite simple. 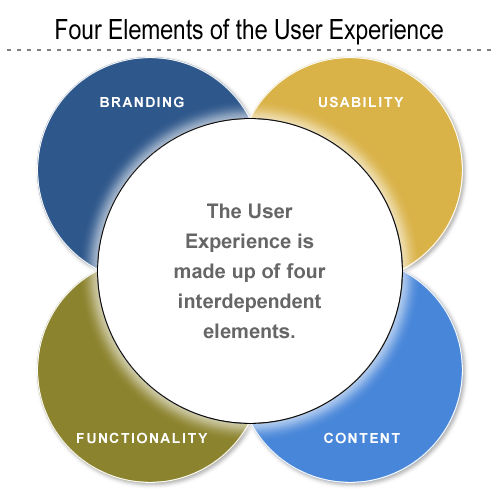 We separate our analysis into four sections — one for each of the four elements of the user experience. For each of these elements, we create a series of statements or parameters against which the Website in question will be measured. A scale of 1 to X is created for each of the statements; we give each statement a score within this range. Once you’ve completed this first part of the analysis, you should have a score for each of the statements in each of the four sections. In the sample analysis attached to this article, we only used five statements or parameters for each element. Consequently, we work with a 20-point scale, so that the maximum total score of the site is 100. 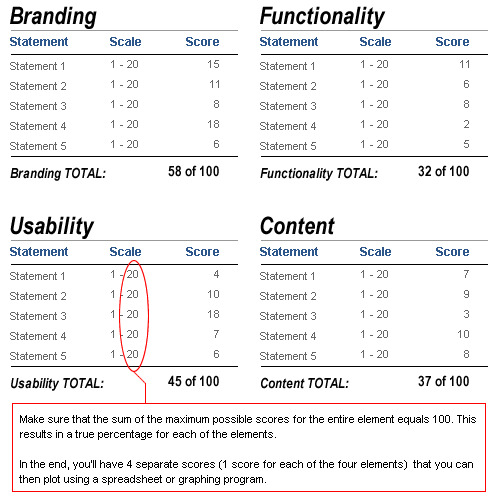 So, if we added an extra five statements or parameters to each element, we’d rate each on a 10-point scale. In most instances, I use from 10-20 separate statements for each of these four elements. I suggest you use the statements above as a basis for creating your own analysis. Remember that if you add more statements, you must also refine the 20-point scale so that each element’s total score is 100. For example, if you used 10 statements for each element, then your rating scale would be 1-10. If you used 20 statements for each element, your scale would be 1-5. Once you’ve completed your analysis and have values for each of the statements or parameters, it’s time to put this data into a clear, communicative format. The first thing we want to do is add up all the values for each element. Because we’ve set the point scale to provide with a maximum score of 100 for each element, what we really have is a percentage score. Once we have these percentage values, what I’ve found works best is to create a Spider chart to visually represent them. Microsoft’s Excel or Open Office Calc both work well here, although any spreadsheet program with graphing capabilities will do. There’s no reason why you couldn’t add a fifth category to the analysis to describe accessibility or business metrics. For example, say you’ve got a government client that needs to adhere to Section 508 regulations (for the U.S.). You could easily create a set of statements or parameters that deal exclusively with the accessibility element, modifying your charts to display accordingly. Likewise, it would be very easy to create a category that deals exclusively with your client’s important business metrics, for example, ROI, click-through rates, conversions, or repeat customers. Alternatively, this platform of analysis can enable you to add greater weight to particular elements of your choice. Say you have a client who’s a luxury goods manufacturer, and is heavily focused on branding and look and feel. There’s no reason why you couldn’t create a modified measurement system that gave greater weight to the branding elements and less to, say, the usability elements. I’ve incorporated this analysis into a number of different projects on which I’ve worked. Often, I include a ‘quick and dirty’ analysis as an appendix to a new client proposal, to provide the prospective clients a snapshot view of where their site stands vis-Ã -vis the competition. Providing this kind of review also gives you an excellent chance to display your professionalism. Chances are that other firms bidding on the RFP in question will not include such ‘free’ consulting services — and your inclusion of this report in your proposal may be a decisive factor in your favor. In other instances, I’ve had clients pay for an in-depth analysis of their site complete with recommendations. This type of report includes, for each of the statements or parameters, several descriptive paragraphs complete with examples or screen shots. If I’m ultimately hired to follow through on my recommendations, I often schedule another evaluation six months after the launch of the site as a means of showing improvement, while at the same time reinforcing the value of my services. Rob owns and manages internet consulting firm Rubiconsult, LLC., which helps small and medium sized clients use the Internet to augment their sales, marketing, and internal business capacity. In addition, Rob runs sports gear ecommerce sites, including MiamiFanGear.com.